Join us for Belle Aire’s Third Annual Fun Run on Sunday September 30th at 9am! Check out amazing pictures from the event! Everyone is welcome to join us for good ole family fun during/after the race. Spectators: Come to mingle with other families and enjoy LIVE MUSIC, face-painting and more! In case of inclement weather all activities will be held in the gym; we will run outside as long as weather conditions are safe. All participants will receive a race day bag with an official race t-shirt and sponsor-provided materials. Deadline is Extended to Friday 9/21 at noon to be guaranteed your race day t-shirt & bag. Note: Race bags will NOT be delivered to homes this year. ALL shirts/bags are available to be picked up on Friday, 9/28 from 4-7pm at Fresh Thyme Farmers Market located at 325 Ogden Ave. Can’t make it Friday? Pick up on race day. Interested in becoming a race sponsor? Please see our Sponsorship packet. Interested in donating a gift card or other items to our raffle? Please see our Donor form. Note: The payment option “Sponsors will fund race costs” is available in the online registration form. Sponsors donating to a racer/family can make online payments by following the instructions here and including a memo with the family last name and “fun run.” Make note of your sponsors intending to make online donations alongside your cash donations to track progress toward your goal! Raffle tickets – YOU DON’T WANT TO MISS OUT!!! Before & ON race day: Tickets are available for purchase during lunch on Wednesdays 9/12, 9/19 and 9/26. You can purchase for $2 each, 3 for $5 or 7 for $10. Winners will be announced on race day. Can’t be there on race day? You do not have to be present to win so buy your tickets now! There will be another raffle on the day of the Fun Run, just for attendees, with additional prizes. Come ready to purchase tickets and win! Learn more and check out the prizes! Come to race and throw pie in a face! As Belle Aire’s major fundraising event, proceeds generated from this event will support PTA efforts which include educational programs, theater trips, school events &assemblies, art awareness, and more, while promoting health and wellness among our students. 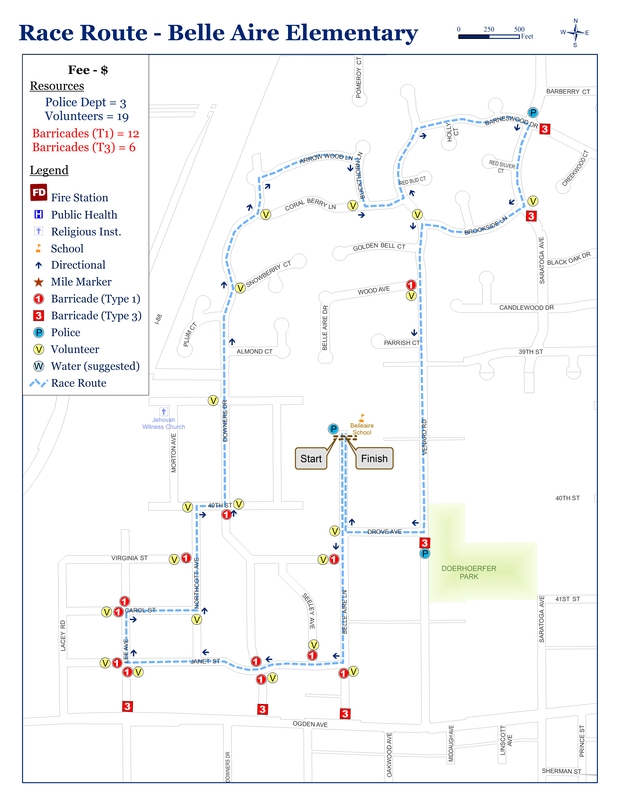 Day of Race Parking: All streets on the race route will close a half hour before the race begins and will open once the race is complete. Parking is available on the non-route streets or at Doerhofer Park. Contact us with questions or a desire to help! Make sure to visit our Facebook Page to see some great photos from the fundraiser. You don’t need a Facebook account to view them, but if you are a Facebook user, please like our Page to help you stay connected! The Second Annual Fun Run was Sunday, October 1, 2017! The First Annual Fun Run was Sunday, September 25, 2016! Results: Belle Aire made $10,560, including sponsors, and had expenses of $3,300; net profit approx $7,300.